Ensinger's DELRIN®100AF blend stock shapes are a 13% PTFE fiber filled homopolymer acetal. 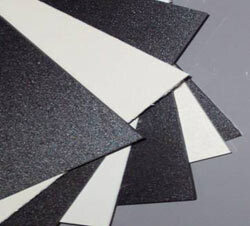 They offer an improved coefficient of friction, better lubricity, and improved wear characteristics over unfilled and PTFE powder filled acetals.This advanced acetal material uses a combination of PTFE fibers uniformly dispersed in Delrin acetal resin. The combination results in improved wear characteristics along with strength, toughness, dimensional stability and machinability. The materials exceptional wear properties and internal lubrication serves to reduce or elimanate the need for external lubricants. Ensinger can also produce a full strength 20% PTFE filled version. DELRIN®100AF is often used for applications such as bearing, bushings, cams and other antifriction devices that also require extra toughness. Moisture Absorption @ 24 hrs. This information is only to assist and advise you on current technical knowledge and is given without obligation or liability. All trade and patent rights should be observed. All rights reserved. Data obtained from extruded shapes material. DELRIN® - Registered traemar of DuPont.